You know how it is with insurance agents – as a commission-based job, their income largely depends on the number of clients they manage to rope in. If you are an insurance agent, you will want to know how to go about filing your income tax return. You will also have scores of questions like which income tax return form to file and how to report Insurance commission income and how to claim certain expenses in your return among others. Let’s understand these through a case study. Read on, if these questions strike a chord with you. Meet Gaurav – He worked for 10 months in the financial year 2017-18 with LIC and earned a salary of Rs 45,000 per month. Gaurav started working as an insurance agent, starting in February 2018. The total commission earned by him that year was Rs 59,500. Out of which Rs 34,000 is earned from commissions from LIC policies (new policies sold and first year’s commissions) and remaining Rs 25,500 is earned from the renewal of LIC policies. Since he just started his commission work – he does not maintain any records relating to his agent work. Gaurav also spent Rs 8,500 in telephone calls and commute, which was spent exclusively in securing these commissions. Gaurav contributed Rs 36,000 to EPF when he was in a job and deposited Rs 50,000 in PPF. First, let’s help Gaurav find how his income from being an insurance agent will be calculated. If the commission earned is less than Rs 60,000, the deduction on the first year’s commission is 50% of the commission. In case of renewal commission, the deduction available is 15%. However, the maximum deduction allowed shall be limited to Rs 20,000. Total Deduction = Rs 20,825 but the maximum deduction will be allowed only upto Rs 20,000. Do note that no other expense is allowed to be deducted from this insurance commission. In case, the separate figures are not available then 33 ⅓ % of the gross commission will be allowed as deduction. Gaurav has also heard about the presumptive method of taxation and wants to know, whether an insurance agent can file ITR-4 or not. Gaurav is not eligible to file ITR-4. This is because those who carry on business or profession of Income from commission or brokerage or an agency business cannot file ITR-4S. Similarly, those who are in the profession of legal, medical, engineering, architectural, accountancy, technical consultancy, interior designing etc (See the list of eligible businesses for which one can file ITR-4 here). 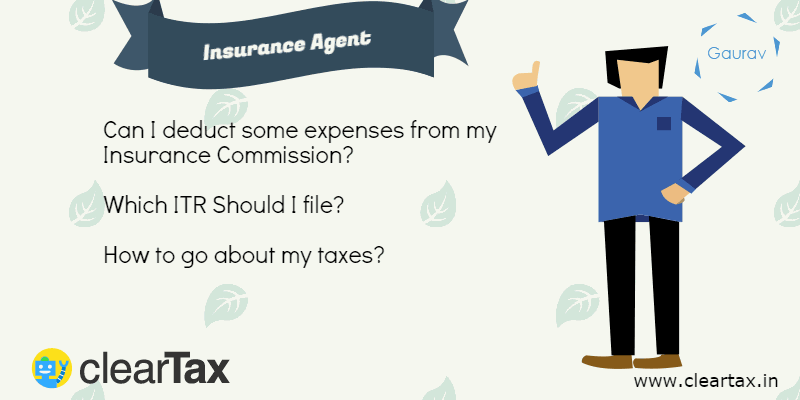 Since Gaurav earns income as an insurance agent – he must file ITR3. Gaurav wrote an email to support@cleartax.in and we filed ITR3 for him? Write to us support@cleartax.in if you have any questions.